Make no mistake about why the U.S. dollar is rising; the long-term health of the world reserve currency is still as precarious as it ever was despite the recent pick-me-ups it's received in foreign exchange markets. 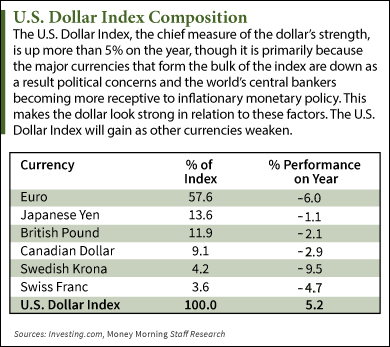 The U.S. Dollar Index, which charts the strength of the U.S. dollar against six world currencies through a weighted geometric mean, is up 5.2% this year, and 1.9% on the month. But this is more an indication that traders should be bearish on other currencies, as opposed to bullish on the dollar. The index is comprised of various currencies, each assigned a certain weight that goes into determining the index's final figure. The bulk of the calculation comes from the euro, which makes up 57.6% of the index, followed by the Japanese yen at a 13.6% weight, and the British pound sterling, which comprises 11.9%. Together, these three currencies represent 83.1% of the index and explain why the main dollar index has been performing as well as it has this year. The British pound sterling has been making headlines this week because it recently closed at its low on the year of $1.6105. Growing support from the Scottish independence movement has threatened to break up the U.K. and, as a result, stoked investor fears about the nation's currency and prompted some to exit. No doubt this helped push the U.S. dollar index to a 14-month high, approaching levels it hasn't seen since July 2013. As of market close Tuesday, the dollar index reached $84.42. But while the stories out of Great Britain may have given the dollar the boost it needed to approach yearly benchmarks, the strength of the dollar has been overstated for more than a year. "Right now, there's little doubt that the weakening euro and British pound are helping to lift the dollar," said Money Morning Resource Specialist Peter Krauth. "Not that they deserve to be strong, given [quantitative easing]-type policies in both currency zones. I think the dollar's benefitting, as it has so many times in the past, from its safe-haven status, and that's what's pushing it higher temporarily." Where can i read the rest of this article ? Gary, simply put your e-mail in the box where it says "Get Full Access Now" and the est of the article will appear.